In Parts 1 and 2 of my article "Bridging the gap between karate and the internal arts", I discussed my design of an experimental or "research" form ("kenkyugata") - one that is an "external/internal hybrid". In this essay I wish to describe and discuss the "final product" in detail. The goal of this project was to create a form for external martial arts practitioners (in particular, karateka) that enables them to assimilate into their practice some of the principles/concepts (意 or "yi") of the internal arts relating to efficient momentum transfer - both for defence (effective evasion and deflection) and counter attack (landing blows more securely and with "whole body" force multiplication). Above all else I wanted this kata to be sufficiently familiar to karateka: I wanted to avoid the need for them to undergo lengthy training in the outward form of the internal arts (called 形 or "xing" in Chinese). The latter can take many, many years to achieve in the traditional way and for very little benefit in the shorter term. I believe that this factor dissuades many external artists from pursuing this course of action. So my concept was to use the outward form (xing) of a common, basic karate kata - in this case the goju forms known as gekisai - modified so as to permit the overlay of internal arts concepts (yi) on that form. A video of the final form - "jisui" - is embedded below. My performance of "jisui" - my completed "kenkyugata" hybrid internal/external form. Read on if you want to see how it was designed. In order to discuss my final "product", I will first need to examine gekisai's external paradigm more closely, noting the issues that run contrary to internal arts principles. With that understanding as a foundation, it will hopefully become clearer as to how I modified the gekisai template so that it could be consistent with those principles. Gekisai kata (in both ichi and ni versions) opens with an off line evasion, a block and a counter. The off line evasion is performed by stepping forward with your right foot, then pivoting 90° (on the balls of your feet) to face your opponent. It is worth noting that many schools perform this as a kind of "informal, short forward stance" (han zenkutusu dachi). I perform it as a sanchin dachi. The way I look at it, there's not much use having such a great stance as sanchin dachi and not using it in a more dynamic context like this. In fact, I use sanchin dachi in all my goju kata. 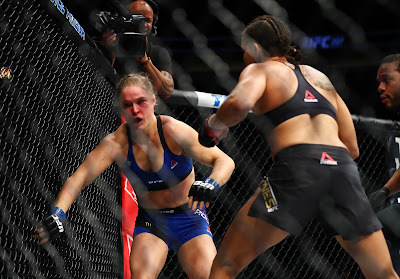 The counter is then performed by making a full step and punching off your leading arm (a lunge punch). As I've previously discussed, this is unrealistic in the sense that lunge punches are rarely performed with a full step through. I believe the latter is largely because of the problem of "dead time" in "natural stepping" (ie. where one leg passes the other). Clearly, "natural stepping" costs you "dead time" and this is very likely time that you don't have. However the cost of such stepping goes beyond the mere "dead time" factor; it also goes to loss of connectivity between movements. In this regard it is worth observing that with every "block and counter" you have two moves in response to your attacker's one move. I've previously discussed that while this is potentially problematic, you often simply don't have a choice but to resort to "late initiative" comprising a block and then a counter; defence comes first under the civilian defence goal of "not being hit" (rather than "hitting"). So, faced with the reality of late initiative, what you can you do to "make it work for you"? As I've previously outlined, you need to connect your block and counter as much as possible so that they flow one into the other. In so doing, you can ameliorate the fact that you've been forced (both by circumstance and ethics/law) to respond to many attacks in civilian defence, rather than pre-empt them. It's also about improving your chances of successfully transferring momentum into a resistant opponent in a dynamic setting. After all, your opponent isn't just a "board who doesn't hit back": he or she is actively trying to thwart your responses - both by trying to hit you and (more relevantly) by not letting you hit him or her. By contrast, if you look at the adjacent pictures you will note that in the traditional gekisai kata this is far from the case. This is followed by the full step-through (with the "dead time"), then a punch. The net effect of this sort of performance is that it chops up the two moves of "block and counter" so distinctly that it completely divorces them from each other; they become two separate events with absolutely no connection other than that they follow each other sequentially. the strike "segment" is divided into a step, then a punch. As you can see from the adjacent gif, it doesn't need be this way. With the right "internal arts" connectivity, you can make any "connected 2:1" off line step and block come very close to 1:1 - I believe, close enough for it to work against a resistant, determined attacker. Now it is true that there is merit in the external "template" seen in gekisai. For one thing, it serves as a means of teaching "stem cell movements" - which is precisely how I believe the external arts came to lose their focus on "connectivity" (ie. momentum flow). For another, it serves to inculcate more fundamental concepts like solid structure, hip use, balance and other good basics. But, whichever way it goes, this approach is the polar opposite of the internal arts: its focus is more on fixed points (ie. "postures") rather than the transition between those points (ie. connectivity or "flow"). So how would the internal art "connect" the opening sequence in general terms? I believe the most basic (karate-like) outward form (xing) would have one moving in the way I've illustrated in the adjacent series of images. You will note that the block wouldn't wait for the pivot to face the opponent: it would occur at the same time as you step offline! In order to make sure that you aren't interrupting your flow of momentum, the form would carefully take into account where your weight is positioned at any particular time and, most importantly, in which direction it is moving. If you consider for a moment that your weight is being transferred to your front leg as you step off line, this means that your back leg is being "liberated" (ie. weight is being taken off it). That back leg is therefore the best candidate for uninterrupted momentum transfer. Of course, this is a very general analysis that still uses karate "outward form" in terms of blocking and countering. It certainly does not reflect precisely how any of the internal arts would actually perform the opening sequence of gekisai kata. I demonstrate the internal arts versions of gekisai's opening combinations. These "internal" variants of the opening gekisai combination utilize what some people (I believe, mistakenly) call a "simultaneous" technique - ie. having the rising block remain in place7 as the punch is executed (cf. the method I showed above using karate's outward form of pulling the block back with the punch). Despite its relative rarity in karate forms, I have included this "simultaneous block" in my hybrid as it is fairly easy for karateka to assimilate. Furthermore, the added "cover" provided by the keeping the hand in place for a rising block can be quite important (where for chest deflections this issue is less important and the arm left in place can even impede the flow of your momentum - more on that in a minute). You will note from my performance of the form that I have used closed fists. While this is unlike taiji and bagua, it is consistent with xingyi. But, more importantly, it is more consistent with karate which tends to use closed fists more than palm strikes (at least in today's form!). You'll also note that I've used a vertical fist in this particular circumstance. This is a small concession to xingyi (which only uses a vertical fist in these circumstances). If nothing else, I felt would be useful for teaching a bit of adaptability to the karate student. Otherwise, there is no magic to the vertical fist: it merely denotes a closer range (as I've discussed previously). 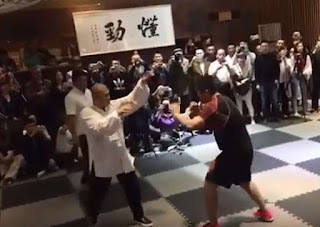 You will recall that I have not attempted to use xingyi's "san ti" or "zhan bu" stance in the opening, preferring a more straightforward zenktusu dachi/gong bu (forward stance) for familiarity and ease of assimilation. The next combination in gekisai is what is known in Japanese as "gedan barai" - a downward sweep. I have previously discussed its use as a downward deflection (uke), but it can also be a strike (uchi) or any number of other movements (unbalancing, locking etc.). The combination occurs immediately after the punch that ended the previous sequence. That punch is executed with the leading hand after a full step through. Given my previous discussion, what you should notice straight away is that the gekisai approach is, once again, contrary to the internal arts principles of preservation of momentum (ie. the "rule against double weighting"). In this case, if the weight is moving onto the front leg, then the back leg should be next to move. (Note the series of pictures on the right.) However this is not what happens. Instead the same leg moves twice in a row. In the internal arts, you should never move the same leg twice except is in the context of a "drop step". For what I mean by drop step I mean the stepping typically found in xingyi (see my article "Xingyi stepping vs karate stepping" and my discussion below regarding the second chest-level deflection). Thankfully there are a few internal arts techniques which follow a similar model - particularly those that step backward with the downward sweep. I'm thinking in particular of the technique known in taijiquan as "Part wild horse's mane" and analogous/related movements in baguazhang and xingyiquan. In each case you'll note that the as the weight transfers to the front leg for the punch, weight is being transferred off the back, meaning it should be the next to move. I discuss moving in the internal arts - including the rule of "never moving the same leg twice (except in a drop step)". After the gedan barai, gekisai once again breaches the "preservation of momentum principle" by moving the leg that had just moved. 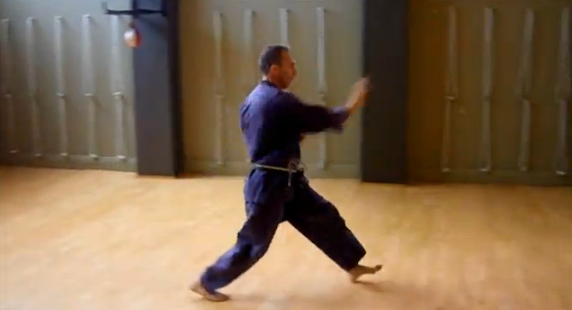 In this instance, the left leg has moved back into shiko dachi (horse stance) with the gedan barai. The same leg is then used to step forward into a short stance (sanchin dachi, in my case), executing a chest block. The next block is then executed with a simple forward step in another short (sanchin) stance. It is important to note that the first block is not accompanied by any sort of counter. If you consider the pause typically inserted between the second block and the subsequent kick/elbow combination, it is arguable that there isn't even a counter for the second block; they are simply too disconnected. As you step off line with your left leg to execute the downward block, it is manifest that you will be moving your weight over to your left. Accordingly your right leg will be free to move. This means that the next leg to move should be the right leg (if you are to "preserve momentum", that is). That right leg will then move forward (or if you prefer, off line forward) with the chest-level deflection being effected by the reverse hand. Why the reverse hand? Because it is the hand closest to the attack - and the general principle is that you block with the hand closest to your attacker. For the purposes of the internal arts "preservation of momentum" principle, this step then "gets the ball rolling": it accelerates your body into motion so that you can make a "chasing step-through" while minimizing the "dead time" issue. Put simply, you don't have to accelerate from 0 while in the "dead time zone" - your body is already travelling at a healthy velocity as you approach it, taking you through that zone in the shortest possible time. In fact, you'll notice that the acceleration is so great that it takes you forward in a very committed way: ie. a way that risks over-commitment. As I discuss in my article "How the internal arts work: Part 1", this is a serious issue - and the central one with which the internal arts are concerned. Neither the taijiquan approach (retracting) nor baguazhang approach (spiralling momentum) are appropriate to prevent this over-commitment. Instead, given the fact that we are advancing forwards at speed, we must adopt principles from the internal art that specializes in this sort of movement - ie. xingyiquan. 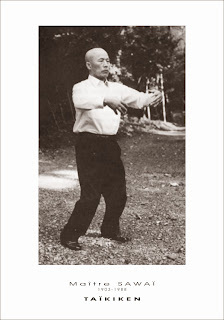 The first xingyi principle to note is that as the front foot reaches its maximum extension, you don't stay in a "gong bu" or "zenkutusu dachi" (forward stance). If you do and your strike misses, this could comprise a catastrophic over-commitment. Instead, you want to shuffle up the back foot to recover your balance. This should happen after the strike lands (as I discuss in my article "Xingyi stepping vs karate stepping). The second xingyi principle to note is that, having executed the shuffle up, for any subsequent steps you must execute what I call a "drop step" - ie. you must move the front leg again. 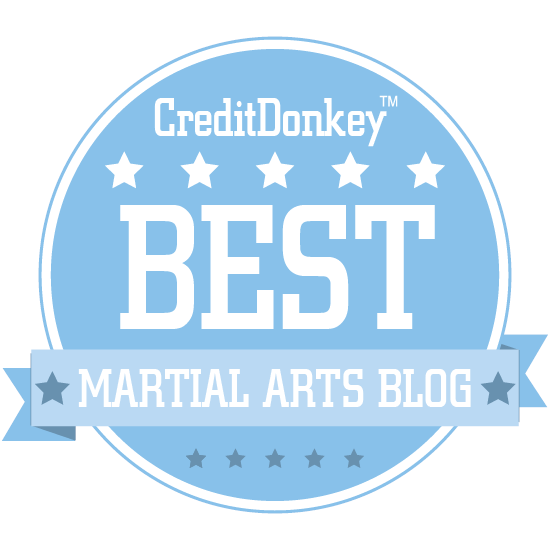 I discuss this in the above article concerning xingyi and karate stepping and, more generally, in a variety of other articles. You'll note that I have preferred the use of open hand chest-level deflections in this form: that is despite the fact that closed fist blocks dominate both gekisai dai ichi and ni. However the two open hand deflections introduced in the second kata do make me feel that they are slightly more sophisticated. Moreover, open hand deflections really do suit the aggressive forward movement, as they help give a sense of "pulling" you into your opponent. Last, I've added two palm heel strikes after the deflections. This is unlike gekisai, but it does accord with internal arts principles of connectivity: there needs to be a counter strike as soon as possible after any deflection/block, the former flowing into the latter. Unlike the above gif, I've also used a "rotation" in the forearms so that your pullbacks are "fingers down" while the palm strike is "fingers up". I think this adds just enough extra challenge for the karateka without overly complicating matters. It also matches up with the roundhouse block and double palm strike (mawashi uke and tora guchi) sequence at the end. 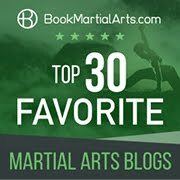 I cover my reasons for using a front snap kick in Part 2 of "Bridging the gap between karate and the internal arts". The kick I've used is a high one - just for fun. However you can always change it to the gekisai low level kick if you prefer. I've used a standard ball of foot kick in my form, but a heel kick can be substituted if one wishes. You'll also notice that I've added a reverse punch that operates simultaneously with the kick. This might seem a bit incongruous to some martial artists and it isn't really a feature of the internal arts as such. It does however appear in the other Chinese "hybrid" external/internal forms that I have learned (I refer to these in Part 2 of my article "Bridging the gap between karate and the internal arts). More generally it also helps teach the internal principle of landing hand with the foot, which I cover in this article. I wanted the form to have a standard corkscrew punch - for familiarity, if nothing else. Accordingly I added one here and kept the other reverse punch after the elbow/gedan barai combination. 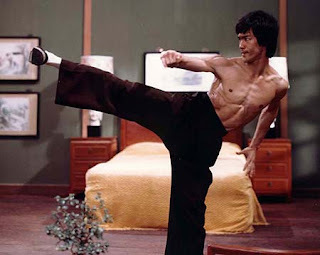 I also wanted to exploit the principle to which I've previously referred, and that is that a kick in karate (and the Chinese arts, for that matter - internal and external) rarely extends past the length of your arm. I like the idea of this "double technique" reminding us of this very important fact. For the combination comprising the elbow strike, forwards uraken and downward sweeping deflection, I've decided to pretty much keep the sequence exactly as it is in gekisai. The difference is that I have elected to use a "shuffle up" between the elbow landing and the uraken/gedan barai. This is in keeping with xingyi's use of "falling momentum": it stops you being over-committed in forward stance (zenkutsu/gong bu) as you land your elbow strike. Put another way, it enables you to recover from that position with relative ease. It is worth noting that it is only here that I would advocate the use (in a very transitional way!) 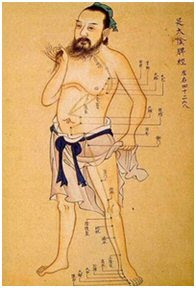 of xingyi's "san ti" or "zhan bu" stance. While the stance is typically very difficult to learn, karate students will find themselves passing through the position very naturally in this context - without having to "rewire their brains" in the process! The shuffle-up also adds forwards momentum to the otherwise weak uraken. Last, the shuffle up into the "xingyi stance" permits a further lunging step with the reverse punch. This adds momentum flow to an otherwise "flat-footed" segment of the original kata. There is no need for a further "xingyi stance" to be effected after the reverse punch as (fortuitously) the next move is a 180° turn. Accordingly you can use what would have been the "shuffle up" to power the turn, stamp and reverse chop. The chop is basically identical to the gekisai performance. The only thing to note is, again, which foot moves after the stamp. If you look at the adjacent series of images, you will note that as you turn and stamp, your weight lands on your front foot. Consistent with the internal arts principle of "preservation of momentum" your weight is then transferred from your back foot, which is free to move. Accordingly you should step forward with your rear foot. In fact, this is precisely what happens in gekisai: the only difference is that a chest deflection is effected with the leading arm, where in my hybrid form you should effect the deflection with the reverse arm. The closing sequences cover an issue that I've previously discussed in the my article "The enigma of tiger mouth in cat stance". As noted in that article, the only way I've been able to make sense of this technique has been by reference to the internal arts. The "tiger mouth" push ("tora guchi" in Japanese) is commonly effected while stationary in cat stance - but this has very limited function, if any. To my mind, the only logical way to interpret this technique is in the context of movement - where you are using your body to drive the tora guch into the opponent (either as a push or, more probably, as a strike). The most important thing to note with this technique is that the hands should be pushed with the whole body - landing on the "target" at the same time as the front foot does. 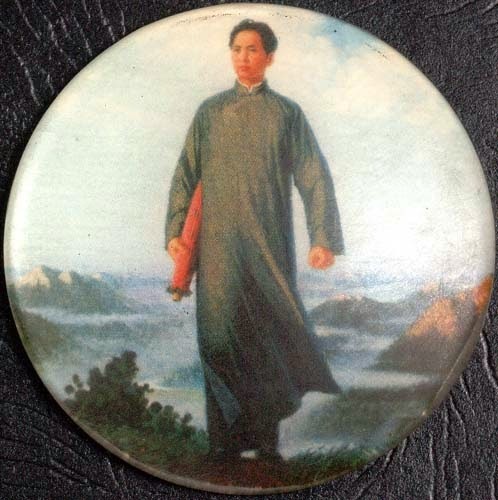 This is vintage xingyi (in that art the strike always lands with the front foot). The second thing to note is that, as with so many other "aggressive" forwards moving internal techniques, you don't want to be over-committed: so once again, your back foot should shuffle up behind. This leaves you finishing with a textbook "tiger mouth in cat stance" - as per gekisai. How you got there is however different. You'll note that after the first "tiger mouth in cat stance", the kata orients you to do an off line movement. You then lunge forwards and pivot around. Only then do you do the mawashi uke (roundhouse deflection) and the tora guchi. But the fact remains that the push occurs in a lunging forward stance - one that is quickly shortened to a cat stance. But does the tora guchi always have to be performed forwards? Surely there are some instances where it is useful to push while moving onto your back foot? Indeed, I think there are. That is precisely where the kata's "stem cell" approach becomes evident: I believe that the presence of tiger mouth in cat stance was intended to enapsulate two different types of pushes - one forwards and one backwards. This distinction is seen in xingyiquan where techniques are also fired either while moving forwards or while moving backwards - with a different stepping pattern. Essentially, if you move forwards, your strike should be timed to land with your front foot. If you move backwards your strike should be timed to land... with your front leg (ie. your front leg moving back)! I shall be examining this issue further in future articles - particularly in relation to xingyi. For now, it is sufficient to note that this rather simple algorithm makes perfect sense in terms of physics and biomechanics; it is geared at driving the full force of your body behind a technique - either to thrust while advancing or to thrust while retreating. If you've made it to the end of this article, then I hope that you've actually gained something from my efforts. Because this project is one that is/was very important to me - and was undertaken with a great deal of passion and energy over at least a decade. It has been my goal to render more accessible to external martial artists the principles of the internal arts of taijiquan, baguazhang and xingyiquan. I have chosen to do so by reference to what is (arguably) still the most popular traditional external martial art world-wide: karate. Accordingly I've tried to stick to the "language" of karate - both in terminology but, more importantly, in terms of technique and movement. The net result is, to some extent, still a work in progress and possibly always will be. I also lament the fact that my own performance does not (I fear) do the concept as much justice as I would like. Nonetheless, looking at the form I have created - "jisui" - I am left with a quiet sense of satisfaction. Despite my failings as a kata designer and kata performer, I believe I have still gone some way to achieving my goal: a very dynamic form that captures the whole body power and flow of the internal arts while retaining the structure and "kime" of karate. So what does "jisui" mean? 撃砕 (ji1 sui4) means "to defeat by smashing". It is just the Mandarin pronunciation of "geki sai". It is important to note that my form is not intended to be a "new and improved" version of gekisai. It is not in any sense meant to "replace" the traditional forms. Rather it is an extension - an extrapolation or exploration of the concept into new territory. "It is obvious that these kata must be trained and practised sufficiently, but one must not be 'stuck' in them. One must withdraw from the kata to produce forms with no limits or else it becomes useless. It is important to alter the form of the trained kata without hesitation to produce countless other forms of training." The traditional gekisai kata of Chojun Miyagi remain favorites of mine: their elegance, effectiveness, simplicity and sheer genius are the precise reasons I chose them as my template. The fact that I've played with that template doesn't mean that I have tried to make it "better". Instead I've tried to add something that is both new and (hopefully) of value. In my opinion the fact that the first block in gekisai (like most karate kata) occurs after off line movement (and not during it) is what permits (perhaps encourages) many karateka to use the hips or "sine wave" to add "power" to a technique that is not a "power strike" but rather a "soft block" (ie. a parry, deflection or redirection). This in turn encourages the idea that blocks were meant to be "hard", or that they are "strikes in disguise" etc. Their dominant purpose is largely forgotten the further the block is divorced from the subsequent counter. And the "power" of the hip or "sine wave" (which has been artificially and unnecessarily inserted before the block) must then be repeated for that counter. 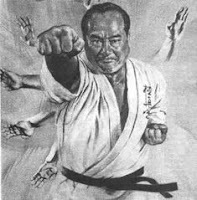 The lack of useful connectivity in karate kata is only compounded by the fact that many external martial artists go even farther down the road of "disconnection" - whether with "power generation" strategies such as "hip wiggling" or "sine wave" or simply by way of artificial pauses "for effect". And this takes karate techniques farther and farther from being able to be applied (prompting derision from combat sports practitioners and so-called "reality based" systems, etc.)! No small wonder then that so many karateka have decided themselves that "blocks don't work" - or revised their meaning with the mantra: "blocks are strikes in disguise" (or "locks, throws etc.in disguise" - anything but "blocks"!). The internal arts principle I call "preservation of momentum" is usually (I believe erroneously) called the "rule against double weighting". Essentially I believe the principle is less about not having your weight distributed evenly over both feet than it is having your weight constantly moving from one foot to the other - ie. not being caught "flat footed". But what of "dead time"? Are you not still performing a "natural step" in my "internal" method of doing gekisai's opening sequence? Indeed, you are. I didn't mean to imply that natural steps should be avoided completely. In fact, they cannot be avoided. Sooner or later every fighter will find one foot passing the other. The trick is to minimize the use of natural stepping - and to maintain momentum once you've accelerated. In this case, the initial "drop" into the offline position provides you with instant acceleration, and you maintain your momentum flow from there. My decision to insert into my hybrid form the sequence known as "fair lady works at shuttles", "pao quan" or the bagua equivalent arose out of the development of my "interim forms", illustrating the function those forms played in developing my final result. There is a common misconception in the internal arts that one should not "raise the shoulder girdle" with rising block (jodan/age uke) as is done in karate. I dispel this myth here. Xingyi, like karate, moves straight forward much of the time, but a slight off line movement is clearly implied, to be executed to the smallest degree necessary. 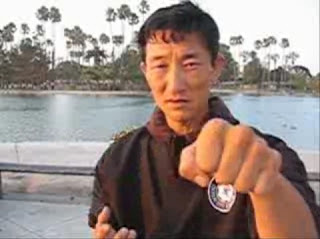 If you want to practise two versions, as per gekisai dai ichi and ni, one can be done with closed fists for the chest-level blocks and counters and in the closing sequence, while the other can be done the way I demonstrate the form. Fantastic post Dan, it ties together pretty much everything you have blogged about over the past year or two. Its an advanced post - you need to have read all the other posts in order to progress to this one (see what I did there?). Footnotes 1-3 are a nice concise post in themselves, I imagine they would resonate with many hard stylists that struggle with the cognitive dissonance inducing blocks of their styles. Thanks Stuart - I'm gratified that you read the whole thing, never mind that you got something out of it! Yes, it occurred to me that this post does tie together everything I've written about for a few years. I suppose that isn't surprising: in creating this form, I was obviously going to draw from the pool of all my thoughts/theories. I confess I havent read the whole post, but scanned and watched some videos. I was expecting the internal hybrid kata to be done slowly, more like Tai Chi. Instead your doing it quite fast, similar to the loose fast flow wushu practitioners choose to do their forms in. First, I rushed the performance ("camera nerves", unfamiliar form, trying to apply karate "kime" with wushu flow, etc.). Second, if you watch the last 3 videos in the footnotes, you'll see what you describe. This post is so friggin' long! Great job my friend. Impressive to say the least! Keep keepin' it real Dan-san. Cheers Jesse! Yes, it is very long but then again that's what you get when you set out your own research notes in a blog! Nice job with creating the kata. I probably would of put some more natural pauses in there but I'm not sure if that go against the internal arts concept. I'm definitely going to try and learn it if I get time though because I really like the concepts - especially for the flow of sparring and stuff like that. Thanks! Of course, you can pause anywhere you like in the form. I'm annoyed that I overdid the "flow" in my performance and generally rushed it ("camera nerves", unfamiliar form etc.). I'm really not a good "kata perfomer"!